Actress Lori Loughlin left federal court with her husband Mossimo Giannulli last week. 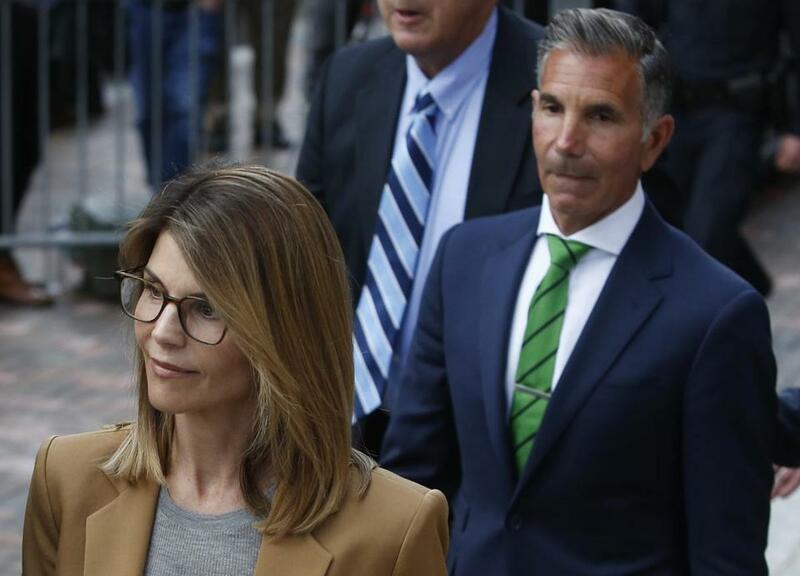 Hollywood actress Lori Loughlin, her husband, and 14 other wealthy parents implicated in the college admissions cheating scandal were indicted on money laundering charges Tuesday, opening a new phase in the high-profile case. A federal grand jury in Boston returned an indictment against Loughlin, 54, her fashion designer husband, Mossimo Giannulli, 55, and the other parents whom prosecutors charged last month with conspiracy to commit mail and wire fraud for allegedly paying bribes to help their children gain admission into top colleges. The parents are accused of paying bribes ranging from $50,000 to $1.2 million to have their children falsely designated as athletic recruits or have someone else take or correct SAT and ACT exams to boost the scores. Loughlin and Giannulli are accused of paying $500,000 in bribes to have their daughters designated as crew recruits to gain admission to the University of Southern California. Neither daughter participated in the sport. The money laundering charges were handed down one day after 13 parents, including actress Felicity Huffman, said they intended to plead guilty to a sole count of conspiracy to commit mail fraud and honest services mail fraud. Lawyers for Loughlin and Giannulli didn’t respond to requests for comment on Tuesday, but attorneys representing some of the other parents challenged the government’s case. The indictment charges the parents with conspiracy to commit money laundering for allegedly funneling the payments through a purported charity and for-profit company set up by William “Rick” Singer, the admitted ringleader of the scheme who is now cooperating with authorities. Singer then used the money to bribe coaches, test administrators, and others involved in the scheme, according to the indictment. He said it could mean that Loughlin would face several years in prison if convicted of conspiracy to commit wire fraud and money laundering. “For somebody with no criminal record who has notoriety as a beloved television star, that’s serious stuff and that’s real time,” Bailey said. Gamal Abdelaziz, 62, also known as “Gamal Aziz,” of Las Vegas. Diane Blake, 55, and her husband, Todd Blake, 53, both of Ross, Calif.
Elizabeth Henriquez and her husband, Manuel Henriquez, both 56 of Atherton, Calif.
William McGlashan Jr., 55, of Mill Valley, Calif.
On Monday, federal prosecutors filed a plea agreement indicating they will argue that Huffman should serve between 4 and 10 months under sentencing guidelines. They will recommend she serve a term at “the low end” of that range. The guidelines, which are advisory, are based on the amount of the bribe. Prosecutors will also seek a $20,000 fine and restitution. Huffman’s lawyers say her sentencing range should be zero to six months, according to the plea agreement. The judge will decide her sentence. Huffman allegedly paid $15,000 — significantly less than most of the other parents charged in the case — in 2017 to have someone proctor her daughter’s SAT exam and correct her answers afterward. Huffman was scheduled to plead guilty before US District Judge Indira Talwani on May 24, but has asked the court to reschedule it to May 21. Shelley Murphy can be reached at Shelley.Murphy@globe.com. Travis Andersen can be reached attravis.andersen@globe.com. Follow him on Twitter @TAGlobe.